When starting the conversation about bullying with a child, you need to set a proper foundation first. Otherwise, the focus always tends to be one reacting to a particular situation. This leads to only treating symptoms and not the disease itself. We need a method that teaches children to take responsibility for themselves and become part of the solution. Parents and teachers are here to give them the guidance, the tools and the skills to develop a strong self-worth and have healthy relationships. Everyone gets to choose how the respond to any particular situation. Tell them: You don't have to reflexively react. You get to choose who you share your experiences with and who you confide in. You get to choose preparation and prevention. You only give up your ability to choose when you let the bully take control. Make sure a child know that their voice always matters. Tell them, and show them you are listening. As parents, it's important to always be receptive and listen to the small things now, so that they will feel confident and comfortable to tell us the big things later. Tell them: We are listening to you. What you say matters, good or bad. Speak up, and we will always support you. Stand up for yourself. Stand up for others who may not be as strong as you. "Be aware of your self and be aware of others." Self awareness and self-improvement is only the beginning. Tell them: Take care of yourself first. Make yourself strong and confident. But, that's only the beginning. Smile and be kind to everyone. Reach out with a helping hand, you never know who needs it. "Bring your fear down to earth." Kids, and adults, often leave fear in the abstract, thus letting it become larger than life. Identifying and making it tangible, then makes it surmountable. Tell them: Name your fear. Then we can know what it is. Once we know what it is, we can figure out how to deal with it. "Practice with someone you trust"
At a certain point, your child will need help. They will need to practice and role-play situations so that they can train a proper response. It could be a parent, sibling or friend. Tell them: We need to bring out what's happening and look it in the eye. It's not fair, but someone might not be there to help you. To face a bully, you need a plan and to practice. If that day comes, it won't be the first time you've had to deal with it because you practiced it so many times. "You don't have to fix it, but you should try to help it." 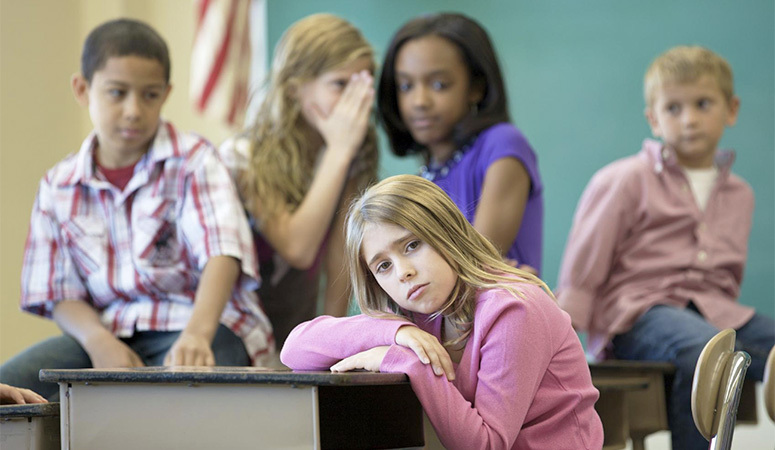 When witnessing others in a bully situation, it's easy to ignore it. And, it can be intimidating to jump in to try and solve the situation. Tell them: Even if you're not getting bullied, you can still help. You can mention that a teacher is coming. You can interrupt to ask a question as if you didn't know what was happening. You can refuse to text or talk about others behind their backs. If a situation is really unsafe, you can go and get help. "Find out which adults are best at helping." Not all adults have experience with bullies or have been trained to deal with them. Tell them: These are some teachers, mentors and near-peers that you can talk to. What are some ways you can interact with them? That way you'll get to know them and have a good relationship before you need their help. Toughness is not merely physical capability. It is internal strength, resolve and resilience. Children develop this toughness through self-confidence and experience with incremental challenges. Tell them: Respect others, but respect yourself first. Get to know your best qualities and capabilities. That will build belief in your own value. Don't let any verbal attack stick to you. If someone attacks you physically, we'll learn how to deal with that too. Remember, when you are strong on the inside, everyone sees it on the outside. The problem is, there is no "antibiotic" for bullying. Parents, teachers and children can do everything the right way, and bullying can still occur. We need to focus on what we can control: ourselves. Then, we can also pursue the "Be the coffee" ethos. We won't let external conditions make us too soft or too hardened. We will become the catalyst to make change in our environments. PS. Every child needs a trusted adult and a trusted inner-circle. These people serve as a sounding board for developing and implementing social and personal safety skills. Generally, this can be family member, teacher or a coach/instructor. Someone that has a certain set of qualities and a strong relationship with the child based on mutual respect. This is someone who has respect and consistent interaction with the child. A strong martial arts community will have a collection of supportive peers, near-pears and mentors. All of our new students start with an Orientation and Intro Lesson. It's a chance for you to meet our instructors, see the facility and determine if our program will be a great fit for your family. Dragon Gym now has locations in Exton, Malvern and Berwyn, PA.